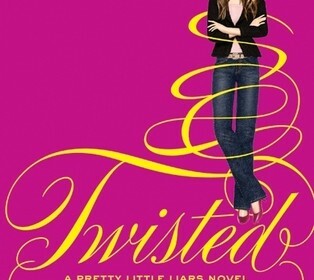 Twisted is about four girls trying to take their perfect lives back since their close friend Ali’s death. However there’s a twist, they think Ali isn’t really dead. Do they go too far when they think they see her in Jamaica, did they make an identity mistake? The girls frenemy A is back after a year free of torturous blackmail, what will A reveal this time? These girls may be pretty, but they have some ugly secrets. Aria, Hanna, Spencer, and Emily are the four main girls throughout the book. A is the elusive villain of the story who has taken on the identity of Ali, as well as the knowledge of all the secrets Ali kept. A uses these secrets to manipulate the girls, by sending text messages and brutalizing the girls with attacks. Setting of the book is mainly set in their hometown Rosewood, PA. Rosewood is a small town with big estates and wealthy families. Everyone knows each other there.. The mood of the book is suspenseful and dramatic, this is shown when, “ That girl. Emily turned to them, her face pale, her lips bloodless. It’s……Ali,” is said. This is dramatic because Ali was proclaimed dead a year ago. I would recommend this book to someone who is looking for a book filled with mystery and jaw dropping moments. However personally I think the appropriate audience for this is 6th grade and above, because it gets pg-13 at times. One thing that stands out about the author’s writing is how the author describes the girls personalities, social lives, and characteristics. The authors vivid description makes the characters seem real. This book is a thriller/mystery, there are action packed times in the story when girls push girls off roofs, and when the girls wonder if Ali is really dead. Twisted’s relatable well rounded characters and addicting storyline will keep you on the edge of your seat.